Rage Lake is the third largest lake on SW Island, following Jensen Lake? and Orton Lake?. It played an important role in the development of the Syntax Estates precinct as it was an optimal area to setup a small shipyard to receive materials for urban development from neighbouring precincts. The area around the Rage Lake Shipyard developed quickly into a busy hub of trade and commerce. Numerous establishments were constructed, such as a large warehouse, restaurant and office buildings. Construction began on a large public swimming pool and indoor facility but the project was cut short after the area started expanding to newer areas. Rage Lake is known to be a very deep lake. This characteristic can be seen from satellite images, as the colour of the lake is a very dark blue (much darker than other lakes on SW Island). Deep sea fishing is a popular sport on this lake and is the reason for most of its tourism throughout the summer months. 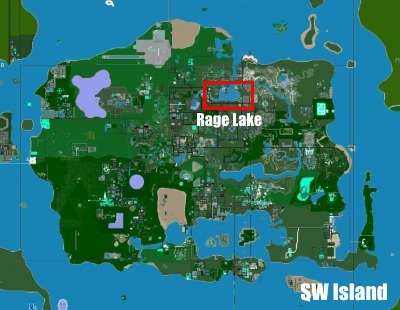 Rage Lake is commercially fished for their prize aquatic vertebrate, the South Rage Carp. What makes Rage Lake unique is that it is a mixture of both salt and fresh water. Fresh water drains in from the Niagara River and Salt water is carried in from the north by the Rage River. South Rage Carp are named so as they only stay in the part of the lake with the highest concentration of fresh water, which is where the Niagara River empties. To the lake's east sits the Ilexus Forest. Much of the forest along the eastern coast has been clear-cut to make room for roads and potential development. A subway station and Syntro Alpha station have been put up as well as a large biodome (which is now closed). The Rage River? connects into the lake from the north and forks out. The northern fork leads to the Irenic Ocean and the eastern fork leads through Ilexus Forest, under the Avatar Mountains and into Orton Lake?. 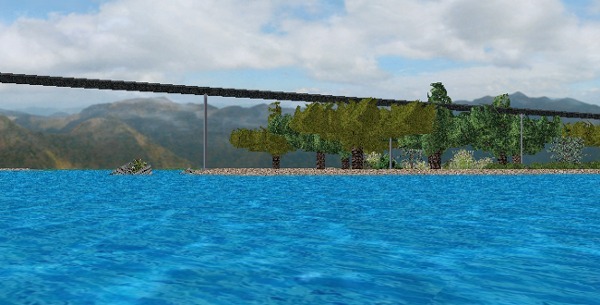 The northern fork is bridged by the Wingzor Bridge. The Niagara River drains into the western side of Rage Lake, which comes from the Niagara Falls. The Ansell Bridge towers over the connection of the Niagara River and Rage Lake, bridging the Boulevards and the Rake Lake Urban Area? together.